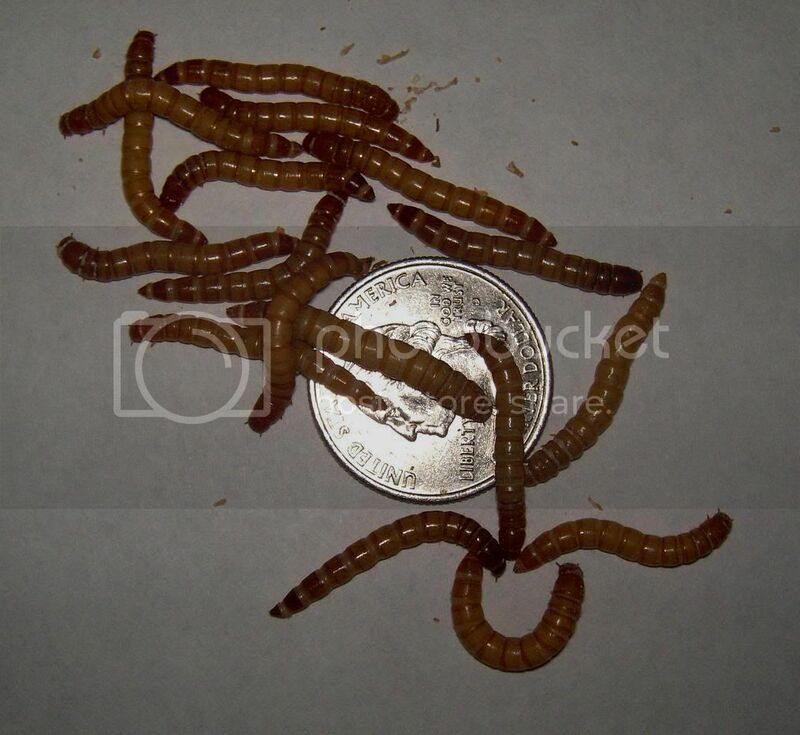 Well, I got bored the other day and decided that once my website was up and running then I'd add a tutorial on how to raise your own mealworms. I've taken everything I've learned from a gazillion different websites and from personal experience and have made a simple tutorial. Container: I prefer to use a clear plastic, 7-drawer unit from Wal-Mart. It has 3 large draws in the bottom(I use 1 for storing extra bedding and the other 2 for beetles. It also has 4 smaller drawers on the top, which I use for storing the different stages of mealworms. Bedding: 2/3 wheat bran, 1/3 powdered skim milk, and a small amount (maybe 5% or less) of Brewer�s yeast. Fill container with about 2-3 inches of bedding. Temperature: 75-80 degrees is ideal. If it�s too hot it will negatively affect the growth rate and size of the mealworms. Moisture: Keep moisture high by making sure that there is always moist fruits/veggies in the container or by putting a paper towel over the top of the bedding and misting it lightly each day. You can also place a bowl in the bedding (high enough from the surface to prevent the mealworms from getting inside) and put a paper towel or sponge inside and soak it with water. Replace the paper towel with a new, soaked towel once or twice a week. If the moisture is too low it will slow the growth rate and overall size of the mealworms. Be sure not too have too much moisture, however, because you don�t want the bedding to get moldy. Light: mealworms prefer the dark and should be kept out of direct sunlight. However, studies have shown that mealworms develop faster when provided with light, so, feel free to experiment with it. Moisture: keep the moisture high by placing a bowl of water in the container with the pupae. Make sure that the beetles that emerge cannot get into it. Bedding: 2/3 wheat bran, 1/3 powdered skim milk, and a small amount (maybe 5% or less) of Brewer�s yeast. Fill container with about 3 inches of bedding. Add an egg carton or newspaper for the beetles to lay their eggs on. Temperature: 75-80 degrees is ideal. Moisture: Keep moisture high by making sure that there is always moist fruits/veggies in the container or by putting a paper towel over the top of the bedding and misting it lightly each day. You can also place a bowl in the bedding (high enough from the surface to prevent the beetles from getting inside) and put a paper towel or sponge inside and soak it with water. Replace the paper towel with a new, soaked towel once or twice a week. Be sure not too have too much moisture, however, because you don�t want the bedding to get moldy. Light: *same as mealworms*- mealworms prefer the dark and should be kept out of direct sunlight. However, studies have shown that mealworms develop faster when provided with light, so, feel free to experiment with it. Check your farm every couple days and remove any dead beetles/pupa/worms. Replace the bedding once it begins to look sandy (that means it�s all been eaten and is now frass/waste) or if it smells. Sift all the beetles every 2-3 weeks. Put the old bedding in a new container (this bedding contains eggs and baby mealworms) and give the beetles new bedding. Be sure to also replace the egg carton/newspaper and put the old one with the old bedding as well because it too contains eggs. It�s important not to allow any of the bedding or fruits/vegetables to get moldy! If anything gets moldy then you will have to toss it out along with the entire container of worms/beetles because any bug that ate of the mold can be harmful to your gliders. That covers just about everything. If you have specific questions feel free to contact me. I know that most sites just jumble all the info of each stage so I tried to separate out each stage since each one has different needs. What do you think? IS there anything I missed? I know there are alot of methods for raising mealies and there are tons of different bedding substrates that you can use, but this is the easiest method I've found and have had the best results with. Wheat bran is the easiest to sift through and super cheap. Mixed with powdered milk and Brewer's yeast is REALLY nutritious. The healthier the mealies are, the better they are for the gliders. Last edited by Guerita135; 05/23/08 04:40 PM. Whoops! everything was squished together. I fixed it. Thank You! You did a fantastic job! Awww I read it when it was squished together.T^T ^ ^ sounds great. I will def. hit ya up bc I want to start my own farm soon to. Yeah! I'm glad you guys approve. I typed it at about 3am, so I figured I probably missed a bunch of stuff, lol. Oh yeah, since the proof is in the "pudding", here's a pic of my mealies. I just grabbed some so I could keep track of their sizes. I'm going to try and breed for size with my next cycle of mealies. I'm waiting for the old beetles to die and, in the meantime, I'm feeding the gliders any "aliens" that are small and refridgerating any big ones. My hopes are that in about 3-4 months I'll have even BIGGER mealies! *The ones in the pic aren't quite full grown, they still have a couple more molts left. I bought my first 1,000 mealworms in January, so it took a little less then 4 months to get full-grown mealies of my own. I copied everything and, wow, it's a heck of a read. This is great! I have one question: what the heck are aliens? Aliens are pupa, which is a stage between a mealworm and a beetle. The pupa looks like an alien, so to speak. Guerita, what an awesome idea! My husband has had a mealworm farm going for more than 2 years now and right now we are getting LOTS of mealworms, now that it is warming up outside. Gliders are HAPPY!!! Thank you. I think I might have found one in my living room. I had lost a mealworm in there a couple nights ago because Mica tried to steal it from Calliope and crabbiness ensued. It was a horror to stumble upon. "The higher the moisture, the more eggs the beetles will lay." According to one of the sources I read, beetles with low humidity laid as few as 4 eggs as day, while beetles with higher humidity laid over 100 a day! Also, I corrected a grammer error. I put the bedding in a new container. Sometimes I'll mix it with the last container I put the beetle bedding in, since those mealies will still be super small, but if you put it in a container with larger mealies then they'll eat the eggs and babies. I tried oats and do NOT recommend it. The oats will not sift through a sifter, thus making it impossible to sift the beetles out of their old bedding you'd have to pick em out one by one. :/ Same goes for the adult mealies. I buy my wheat bran from bulkfoods.com . They've got the best prices I could find online. Check for feed stores around you first thoguh, because I've heard that they sell it alot cheaper. Although, personally, I prefer the food-quality over feed-quality. You can also buy the Brewer's yeast in bulk on bulkfood.com. I got a big container of yeast for just $8! I didn't make any holes because there's a small gap between each drawer. That seems to be sufficient. Ok, I'm having an issue with my farm and could use some suggestions - I use pieces of potato but here lately it's getting fairly humid in the house and I'm noticing the the potatoes pieces look just enough like the beginning of mold that I'm having to throw them out not very long after putting them in. That leaves the mealies with nothing for moisture until the next time I put something in - I'm having the same thing happen with carrots. Suggestions?? I've been using leaf lettuce/greens which provides food and moisture, and it seems to last a LOT longer than the carrots! Are your potatoes turning black? If so, I think that's normal cause that's what mine always did. It gave me the heebie jeebies so I just stopped feeding potato. I use sweet potato instead. As for moisture, I just add a small plastic container to each drawer and plop a wet paper towel in each plastic container. I just have to resoak the towels once a week or so and that seems to be sufficient. No, they aren't black, they actually do look like they are starting to mold, I think the inside of the drawer is too humid even though I have holes drilled on the outside for air. Wowie! What magnificent instructions. So you don't recommend oats because of the sifting. Just curious: why the powdered milk and brewer's yeast? Something more the mealies to munch on besides th food you toss in? When I leave my mealies out to eat, they keep turning into aliens, so I put them in the fridge. I used to feed them to the turtles and ducks in the lake outside, then discovered my babies loved them. But maybe I should start a mealie farm. After they've been in the fridge, they can come out (just like mealies) and be part of the farm cycle again? Your instructions have given me the courage to perhaps try this! Hi! Thanks for the instructions. I used most of your advise, I especially love the plastic 7 drawer container from Walmart! We had to use oats to start with, didn't have wheat bran. So we used advise from another site, and added uncooked oatmeal, corn meal, wheat flour and grinded flax seed. It is working well, but in order to sift, Guerita is right, you can't. We have been having fun "picking through them" but it's about to get old. MY QUESTION: Can we grind the oats and still get all of the nutrition out of them? This seems like a simple fix, but I was wondering if we will loose anything in the process? Thanks again Guerita!!!! Way to Go!! After they've been in the fridge, they can come out (just like mealies) and be part of the farm cycle again? Once they are in the fridge, aliens or mealies, as long as they are still alive, you CAN put them back in the farm! The alien stage only lasts about 1-2 weeks, so I don't know how long you could slow down the process in the fridge? Probably NOT indefinitely? Just curious: why the powdered milk and brewer's yeast? Something more the mealies to munch on besides th food you toss in? The powdered milk is for food/nutrition and the yeast is for the baby mealies to eat so they grow bigger/faster(studies have shown that Brewers yeast will make them grow bigger/faster). Sari, you can grind up the oatmeal, I can't imagine that it would do any harm. Also, you're right, it's intersting and fun to farm mealies. In fact, my hubby got jealous cause I'm so good at farming them that yesterday he "stole" about 200 beetles from my farm so he could start his own farm and see if he could do it better then me. Where do you get your wheat bran? I also bought my brewers yeast from them cause you can get a big container for about $8(if I remember correctly). I don't have any feed stores near me, otherwise I'd just get it there. Do you know when your worms eat the food? Also can you use regular baking yeast?